Last week, the Nigerian government unveiled ‘Nigeria Air’, introducing our latest national vanity project to the world. Several commentators have raised concerns on the transparency, economic expediency, and sustainability of the project, but I am more troubled that the policy interests of our politicians do not necessarily align with those of a majority of Nigerians. It is true that a national carrier may boost some – theoretical – national pride. It may even serve the transport needs of upper and middle class Nigerians. But, for the near 112 million Nigerians who live in some form of poverty, the prestige and function of a national carrier is as meaningful as draping a well-embroidered agbada over a starving child. The proliferation of this type of imitation-statehood policies inevitably disconnects the people from the state. Consider, for example, the significant constitutional amendments signed by President Buhari in May. There was neither debate nor inclination to do so amongst ordinary members of Nigerian society. Contrast this against countries where individuals have a real stake in the state: constitutional changes generate near civil-war levels of opinion even among the poorly educated. The last systematic and deliberate involvement of all Nigerians in a national policy direction was during the creation of the MacPherson Constitution in 1951. That constitution led to independence. Since then, the Nigerian state has deviated from popular aspirations and has been shaped by – and for – the political elite. 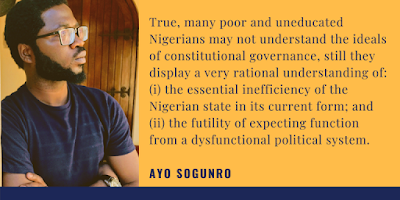 Yet, many well-meaning people continue to think that, without a radical reform agenda, the Nigerian state will somehow work for the best interests of everyone. But disempowered Nigerians are not fooled by this fantasy. This is why, in elections, they vote for their own immediate gratification instead of investing hope in a system that has yielded losses for almost sixty years. Which brings me to the Ekiti state election. The arguments on vote-buying in Ekiti reflect a shocking degree of unawareness by educated Nigerians. The range of reactions – from disgust at the idea of selling votes to admonitions that one party had simply outmanoeuvred the other under conventional rules of the game – ignore a worrisome fact: that a majority of the Nigerian population are squarely and justifiably disinterested in the Nigerian state. Frankly, only three categories of people across the country are still invested in the current Nigeria: (i) the political and economic elite; (ii) the direct dependents and beneficiaries of this elite; and (iii) the – loosely defined – educated middle class. The interests of the elite – and those of their partisan acolytes, sycophants, and cronies – are self-evident. These people are solely concerned with using the political system as a territorial resource exploitation system. To control and exploit resources, there has to be a centralised political state. Wedged between the beneficiaries of our political and economic inequalities and the disconnected and impoverished majority is the educated middle class. These Nigerians, schooled in the ideals of statehood and citizenship, try to create function out of dysfunction. But because they are able to negotiate with the state from a position of privilege, they are typically invested in the continuity of the same dysfunctional political system. It is within this category of Nigerians that the Ekiti vote-buying debate is most pronounced. Typically, the arguments include: blaming illiteracy (We need voter education), blaming poverty (This happens because people are poor), recommending practicality (Collect the money but vote your conscience), or even blaming democracy (Not everyone should be allowed to vote). But these arguments, despite their sincerity, project a disregard for the autonomy of poor, illiterate, and ordinary Nigerian citizens. These arguments tend to be condescending in blame and paternalistic in advice; they are projected through the perspectives and experiences of Nigerians privileged by education. The muted assumption is that underprivileged Nigerians have an unclear understanding of citizenship and, therefore, need guidance from their ‘betters’. 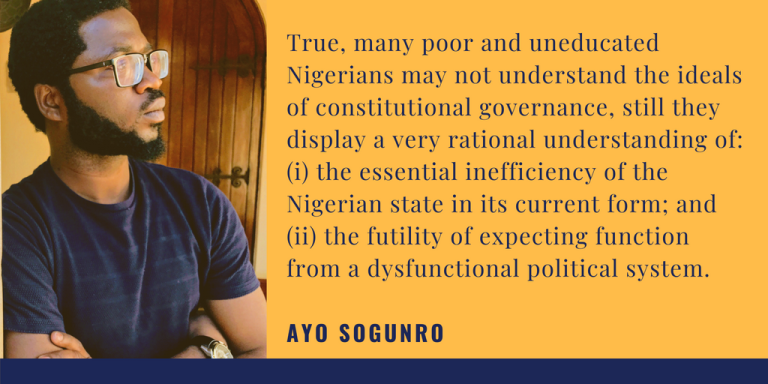 True, many poor and uneducated Nigerians may not understand the ideals of constitutional governance, still they display a very rational understanding of: (i) the essential inefficiency of the Nigerian state in its current form; and (ii) the futility of expecting function from a dysfunctional political system. The people of Ekiti – and oppressed Nigerians in general – are wise not to grant legitimacy to such a dysfunctional political system. In the absence of any real participation, a game of musical chairs ensues. experience that cannot be dismissed simply by the promises of partisan politics. And so, the question is not just how to educate voters or ensure they are well-fed before elections. The fundamental question is: how do we create a political system that empowers, and enables the equal participation and involvement of every individual beyond the ballot box? This question leads to ideas around strengthening local governance, increasing democratic powers at the grassroots, and creating publicly accountable oversight institutions. And, at this point, we are venturing into high-level constitutional and national restructuring. But this will be a topic for another day.